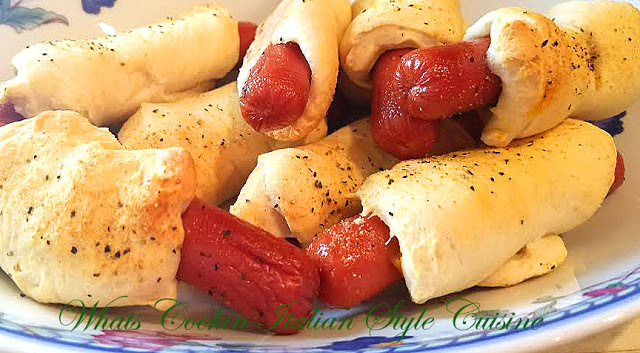 I love an easy appetizer and these are such fun little hot dog biscuit rolls! When I was a little girl, I would help mom make these. She always used pizza dough. When you're in hurry for a great appetizer that's fast and easy this is my go to recipe using refrigerator dough. The kids love them. I actually can't make enough of them, we never have leftovers! Of course the kids think this is a treat since they are so little and just keep popping them in their mouth. Make a Double Batch they go quickly! I learned my lesson to make a double batch from now on. Pizza dough is my favorite to use in this recipe, however refrigerator dough will work great too. 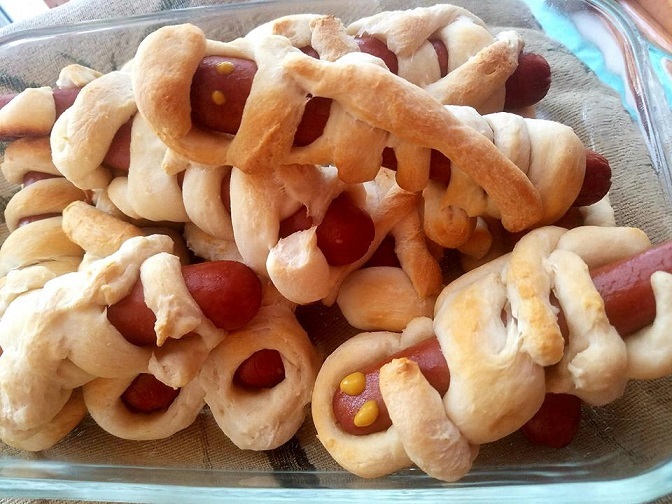 I also like to make these around halloween and make mummy hot dogs with this recipe. Those are adorable and I have a big plate of them ready for the kids. No matter what kind of party you have these will always be a hit young or old. They are a perfect appetizer for all festivities. Fun for the kids and young at heart! These little hotdog rolls are fun to eat! I love making them and they also freeze well. When the kids of hubby wants a snack, I just pop a few in the toaster oven and viola, they're ready in no time! 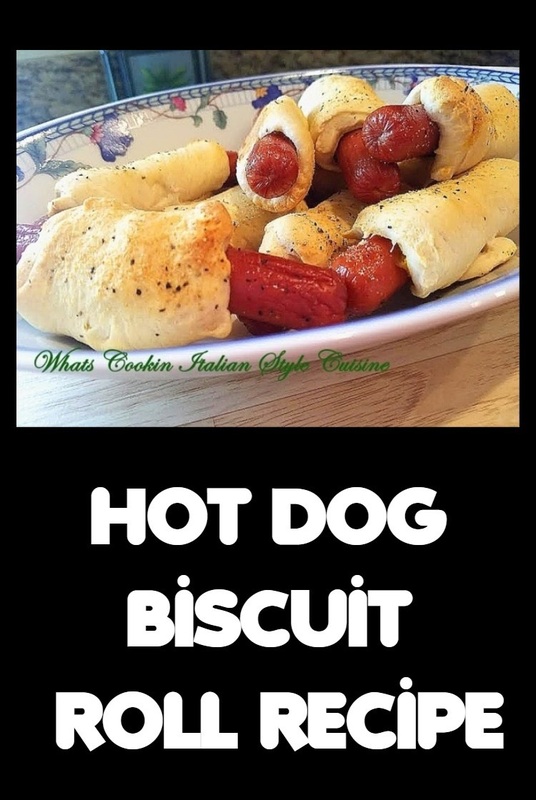 Whether you make these into hot dog mummies, pigs in the blankets or anything else you want to call them, they are a fun hot dog biscuit to eat! 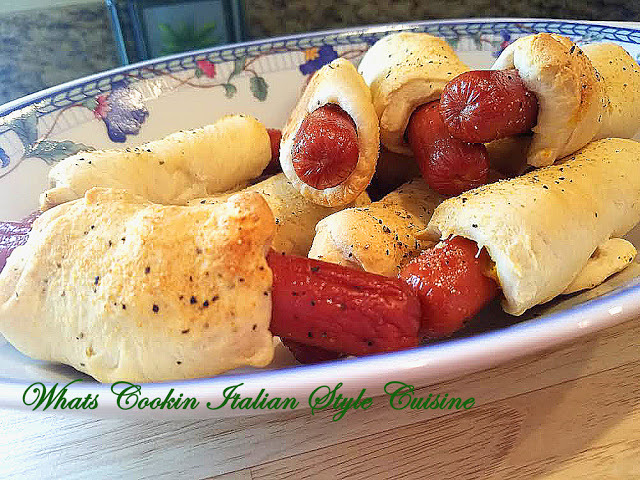 If you aren't fond of making hotdogs in a blanket of dough, try Italian sausage in a blanket. Those are delicious also. Kielbasa, Italian sausage or even pork sausages are all great additions to making pigs in a blanket. 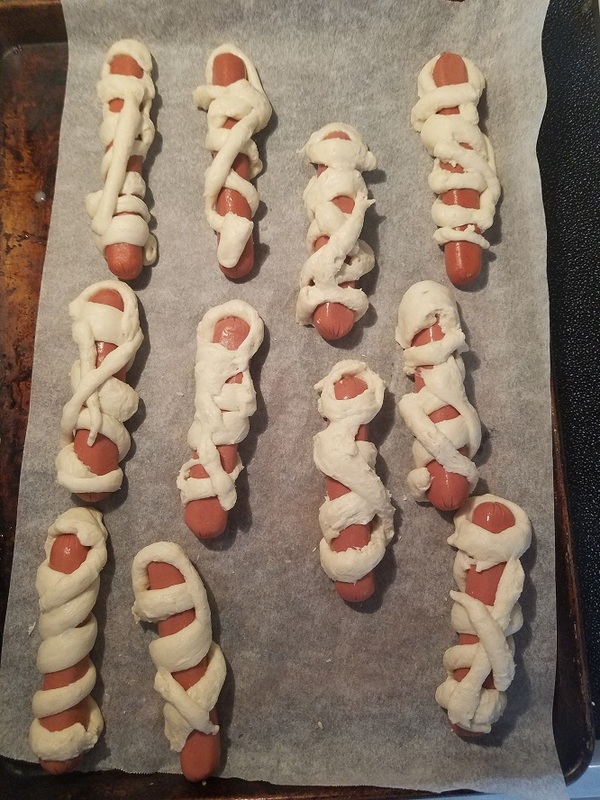 During Halloween I will use pizza dough or refrigerator dough and wrap whole hot dogs and make mummy dogs. The kids love them and can help you make them. Just make strips of dough and wrap a whole hot dog! Just add either two dots of mustard or ketchup for the eyes. You will have to perfect hot dog biscuit rolls shaped into a mummy! Check out my quick little video! Roll out the dough, place a thin line of mustard on the dough. Place the hotdog on the dough roll, pinching the seam shut. Place seam down on a parchment lined cookie sheet. Brush the tops with butter, sprinkle with garlic powder and cracked pepper. Bake on 400 degrees until starting to brown on top. Roll out the dough, place a thin line of mustard on the dough, then small piece of cheese. Place the hot dog on the dough roll, pinching the seam shut. Place seam down on a parchment lined cookie sheet. Brush the tops with butter, sprinkle with garlic powder and cracked pepper. Bake on 400 degrees until starting to brown on top. Hi Claudia, your hot dog biscuit rolls look very temping and appetizing. Thanks for sharing your recipe, I'm sure my children will love it. This would be gone quickly here, great recipe! I remember trying these for the first time when I was a teenager---I didn't expect to like them, but I did!! These must be wonderful with pizza dough!